Welcome to our top 5 list of Farmhouse style chandeliers. Farmhouse style has been very popular this year with no signs of slowing down. Evolving from the style you knew from the past, farmhouse has quickly been transformed to a more modern, simple look and feel. Quorum Lighting’s Salento Chandelier family is our number 5 pick. Salento from Quorum International is a very popular family of lights, continuing its run for several years now. It’s a more traditional style farmhouse look, with a lot of character, accents and design. We see this family used extensively in the traditional farmhouse setting but is also a good choice for that French Country look as well. The Salento series is available in 3 finishes, Persian White, French Umber and Vintage Copper. Numerous sizes of chandeliers, wall lights, vanity lighting and pendants are also available, See the full line Here. Quoizel Lighting Mirren Chandelier in the Imperial Bronze finish is our pick at #4. This chandelier features a simple yet timeless design. 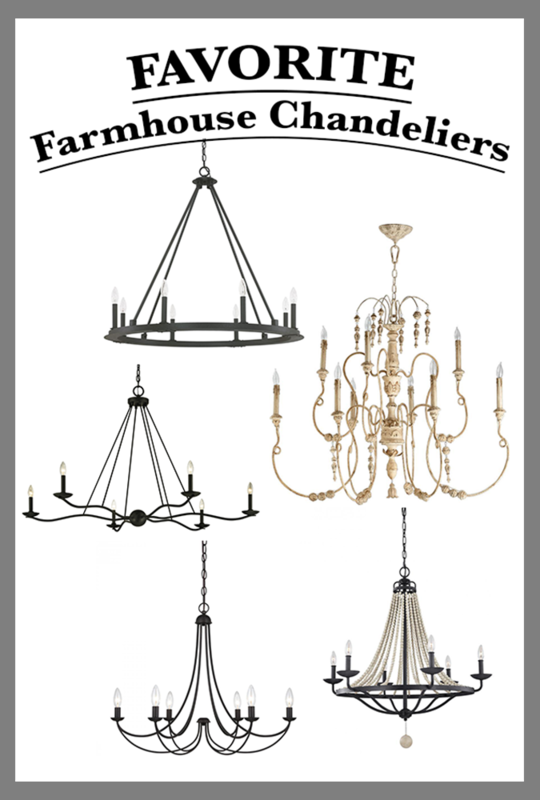 Versatile, this chandelier could be used in several designs from traditional to farmhouse modern. The Imperial Bronze finish is dark and rich. Not quite black, you can still pick up hints of bronze and brown in the right light. This chandelier also looks fabulous with a vintage style amber light bulb. See Mirren Here. The Sawyer chandelier from Troy Lighting is our #2 selection. This chandelier at 53″ wide is a larger diameter piece, more suitable for a great room or entryway. The chandelier is made of forged iron with simply bent arms that extend from a center ball. The straight iron rods that extend to the center canopy from each arm add just enough of a modern feel to balance out the traditional look. This chandelier is versatile and could be used not only in a farmhouse style home but also rustic or industrial as well. Number one hands down is the Capital Lighting Pearson family. Of all chandeliers this has been the most popular for the market during 2018. The Pearson chandelier is a very simple round design with rods that extend up to a central canopy from the frame. The black iron finish is dark and rich with just a little bit of texture. The family is available in several sizes, both single and two tier. The chandeliers supply more than enough illumination for any great room, entryway or dining table. Click Here for the Pearson chandelier. Previous Previous post: 5 Designer Flush Mounts Under $50!